The Toyota GT 86 is the most recent in a long and popular line of Toyota sports cars. 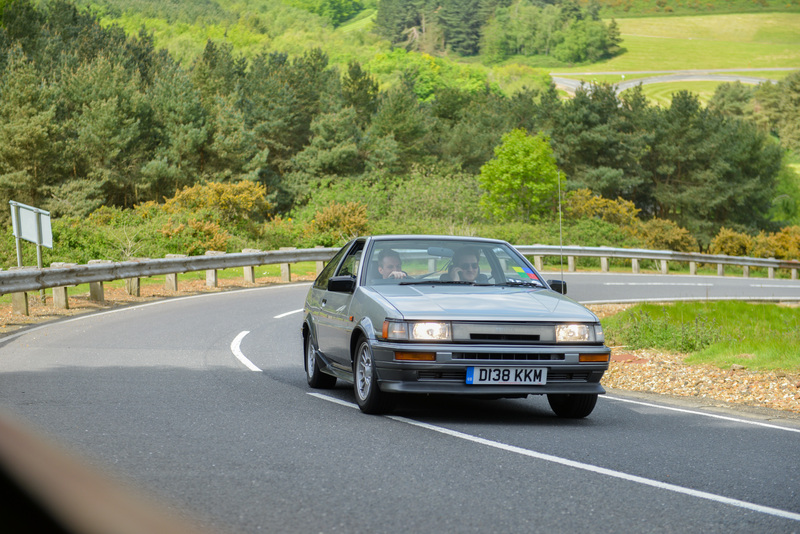 At the Millbrook testing grounds we were given the special chance to drive it alongside its forefather, a now legendary car whose name it carries, the Toyota Corolla AE 86. This provided the chance to understand the enduring magic of the Corolla which helped inspire the launch of the long overdue ‘86’ brand of pure bred Toyota sports cars in 2012. The Toyota’s history has humble beginnings. The AE 86 began production in 1983 and was initially launched as a reliable and inexpensive coupe produced for worldwide distribution. The AE 86’s cult-status is closely connected to the rise of the beloved Japanese racing-driver Keiichi Tsuchiya. Over his career Keiichi worked his way up the motorsport ladder from amateur local road races all the way to the heights of Le Mans, with his car of choice for his early domestic career being the AE 86 bought for him as a teenager by his father. The lightweight rear wheel drive AE 86 was well suited to being slid through the steep winding roads of his home town where he honed his skills, which were then directly transferred to Japanese downhill course competitions. The ability to drift and balance the car through low grip corners would allow him to carry more corner speed than his competitors and thus win races and championships. The sight of perfectly controlled four-wheel drifts and smoking tyres quickly endeared the modified Corolla sports car and its owner throughout Japan and far beyond. 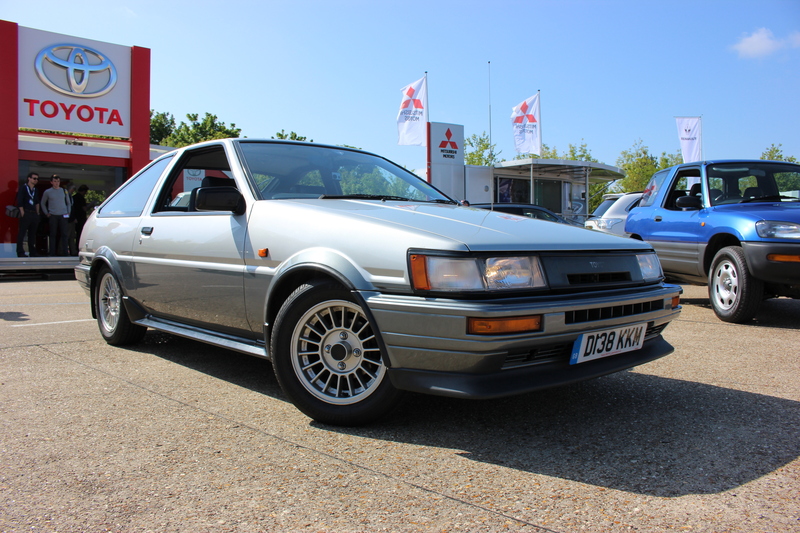 So there I stood in front of a rare unmodified Corolla AE 86 on a crisp British spring morning at the Society of Motor Manufacturer and Traders (SMMT) open test event. Next to a lipstick red GT86, with a throng of motoring journalists fawning over it, the AE 86 looked almost bland. It has a real ‘old school’ look designed at a time when straight lines were preferred to curves. Even its raw specifications are understated with 123 BHP from a 1.6L engine and a 0-60mph of 8.7 seconds. But as I was about to be reminded both Toyota’s are about more than the numbers. 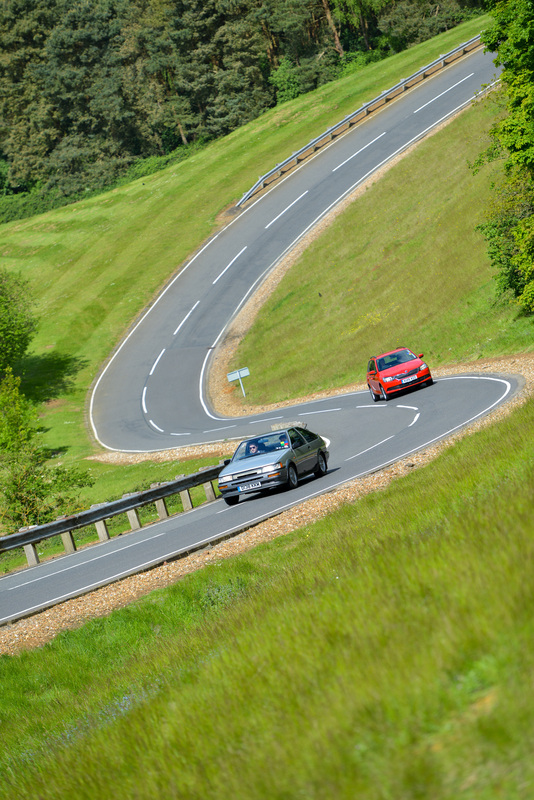 Without further hesitation I set off for my very first lap of the Millbrook hill course, a twisty narrow strip of asphalt bordered by Armco barriers set in the British countryside. The course can only be described as a British Nurburgring as it was built to test cars over steep elevation change, varying radii corners and even a jump or two. I set off tentatively, almost expecting a tail happy car and preparing for the struggle of driving without the luxury of power steering. However, like a well-worn pair of boots the steering was tough yet comfortably loose and altogether very manageable. It takes some acclimatisation but the feel through the wheel is analogue steering at its best – non adulterated and direct. The first few bends I took at a comfortable pace, ready for the rear end to move on me but the car was light, easy to steer and stuck to my lines with a perfect balance. At higher speeds and on winding roads, the car almost wanted to be driven like a go-kart, being ‘chucked’ into the corners and being allowed to shake off any rust. Although I must admit I for once felt no real urge to drive this rare specimen to its limits. Of course anyone who has been lucky enough to drive or be a passenger in this car will attest to the cars defining feature – the sound it makes. Toyota equipped the twin-cam engine with T-VIS or Toyota Variable Induction System. The theory is simple but effective. At low to mid revs the engines air intake is partially closed and narrow, which maintains a high air speed to the engine and allows for maximised torque at low revs. However when the engine is pushed past a 4500 RPM threshold a valve opens increasing the diameter of the inlet, reducing resistance, increasing air-flow and allowing maximum torque delivery all the way up to the 7000 RPM redline. In real terms, what this results in an engine note can only be described as buzzy at low revs, and borderline deafening at high revs. This fantastic torque delivery makes the car feel direct and alive and it is a joy to heel and toe the car as it gives off satisfying grunts of sound with throttle blips whilst you shift through the gears. Of course the drive came to an end too soon and fresh out the AE86 I was ready to explore the GT86. The attention to detail is impressive. The beautiful ’86’ logo of course is a nod to the AE86 of the past, a car whose pure driving experience Toyota were keen to emulate. Toyota have also rather cheekily made it a practical name too as it also signifies the engine’s 86mm x 86mm bore and stroke as well as the 86mm diameter of the exhaust. The steering wheel is free of any buttons or confusing shortcuts to car hi-fi systems. The car is of course more powerful and grippy than its relative – but not excessively so. The car has a relatively modest 0-60mph of 7.6 seconds from a 4-cylinder 198BHP engine, which has been given a shorter stroke to allow the engine to rev higher and gives a driver plenty more noise and thrust at road legal speeds. Setting off again onto the testing track I was immediately reassured by the handling. The same perfect balance is there but the steering is extremely direct and the car obeys your inputs with surgical precision. 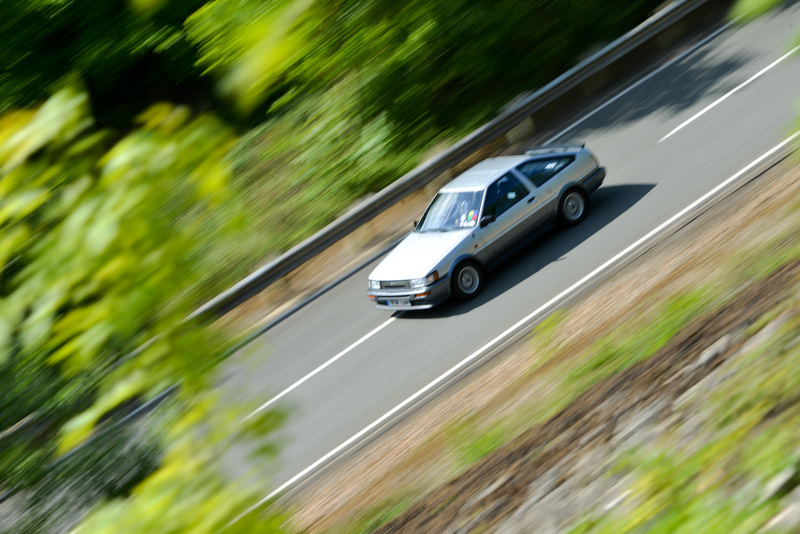 I immediately felt I could push the car hard and within a lap I was able to lean on the car through the corners at speeds I would be alarmed to do in the AE 86. Closer to the limit the car constantly updates you with its grip levels and warns you if you ask too much from it, the front end was occasionally skittish and jumpy through tighter turns whilst looking for grip. It’s a car that seemed impressed by my very modest attempts to drive it fast and I felt like I was making the car work, which gave me huge satisfaction. Unlike some high-performance cars that sneer at your most devilish turn-ins and handle with ease, the GT86 is playful and satisfying to drive. It’s the perfect car for a Sunday drive through winding roads and of the 15 performance cars I drove on the day it was the only car that made me want to do a third lap around the circuit, pushing a little harder and being rewarded with more performance every single corner. So with sadness I had to bring the car back and reflect on the two cars, and indeed the two eras they were born in. There’s no doubt that the technological jumps made over the past twenty years have distilled the pure driving experience for drivers who love to feel like they are an important part of the cars mechanism and revel in the raw sounds and eccentricities of older cars. 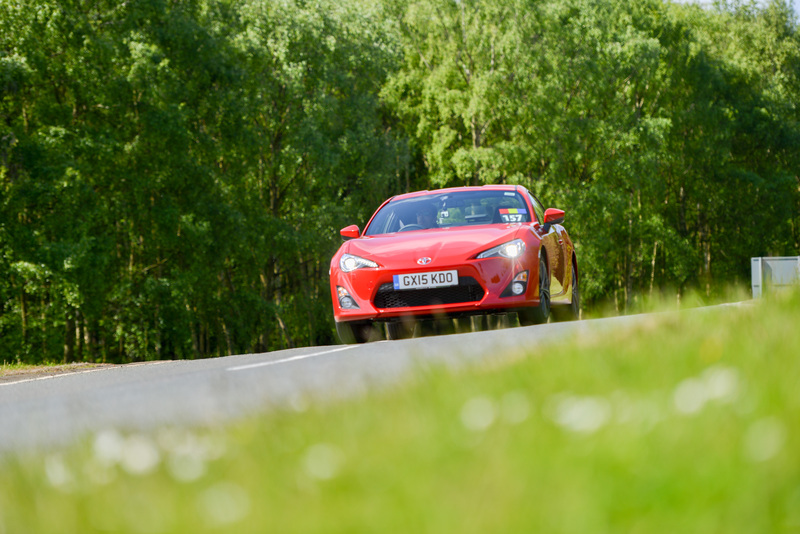 The GT86 sounds like it drives, it’s fantastic, thrilling but not unusually so. By comparison the AE 86 sounds amazing, primal and unlike anything that is produced in a 126 BHP car today. The noise is of course the sound of inefficiency. The engineers at Toyota have re-stabled the loose horses back into the engine in the 28 years since production. However whatever terribly inefficient engineering was involved in its design, it produced something that put the biggest smile on my face.